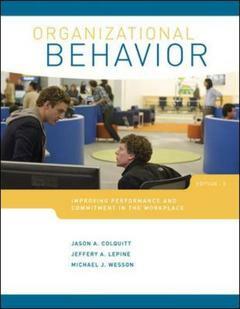 Organizational behavior COLQUITT Jason A, LEPINE Jeffrey A, WESSON Michael J.
Auteurs : COLQUITT Jason A, LEPINE Jeffrey A, WESSON Michael J. After describing these topics in detail, every remaining chapter in the book concludes by linking that chapter's major topic to performance and commitment. Using this approach, students can better appreciate the practical relevance of organizational behavior concepts. To the student, performance is accelerated by providing a conversational writing style, making OB enjoyable to read, showing OB concepts as they are applied today, and including features that readily help students translate OB into the world around them. Connect then serves as the conduit to reinforce those concepts. All this ensures that your students achieve success in the classroom, readying them for today's real business world.